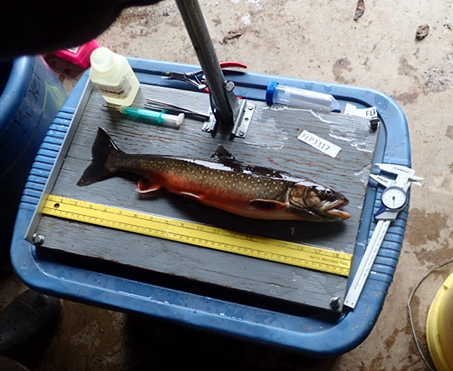 When Arctic char are caught (by angling) at sample sites, data is quickly collected from the fish prior to their release. Maine’s Kennebec Valley Trout Unlimited Chapter is in its second season of using environmental DNA samplingto detect the presence/absence of Maine’s rare and unique “blue back” Arctic char in a handful of  mostly remote lakes scattered across Maine’s North Woods. 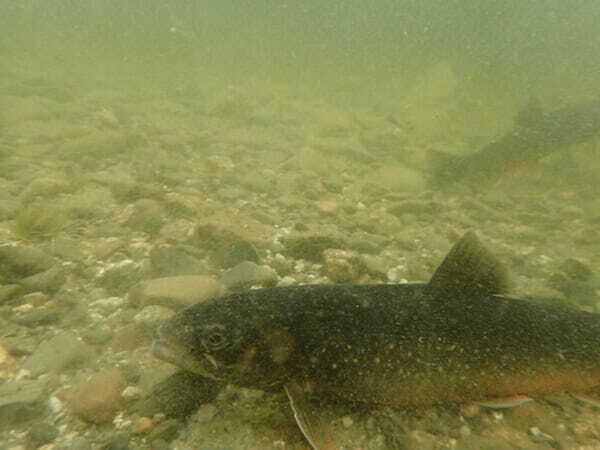 The Laurentian population of Arctic char (sometimes referred to as “charr”), to which Maine’s “blue back” Arctic char belong, are a pond-dwelling fish that spends much of its life living at depth. In 2017 TU worked with the University of Maine and the Maine Department of Inland Fisheries and Wildlife on an effort to collect surface samples as close to ice out as possible. Lake waters turn over shortly after ice out and, for simplicity of sampling, we had hoped the mixed water would include the charr’s eDNA. But results were mixed. Of particular note, in one pond where a long-running UMaine study has documented a robust char population, char eDNA was not detected in any samples. In 2018, we instead sampled below the thermocline at a depth of about 10 meters, where char spend their summers. In theory, sampling at depths where char are concentrated will increase the likelihood of char eDNA detection. KVTU volunteer Steve Brooke developed and tested a prototype deepwater sampling device at a well-known char water in late July  with excellent results, finding char DNA in eight of the 10 samples, as well as eDNA from a competing species known to occur with the lake: rainbow smelt. Steve’s built seven more deep water sampling devices for the effort. The new equipment is assembled from “off the shelf” plumbing, house downspout pipe, and fishing tackle. Light weight (schedule 20) PVC pipe was chosen to reduce the weight of the finished device. Regular schedule 40 plumbing parts were adapted on a lathe. The finished devices are light enough for easy backpacking into some of the remote ponds scheduled for sampling. Sampling took place in September and early October and results are being analyzed. It is hoped the results will contribute to continued development of necessary protections for this unique and at-risk species. Dave Huntress is a long-time TU volunteer and Secretary of the Maine Council. He chairs the Maine Council’s Arctic Char Committee. He works as an engineer and stream restoration specialist. Steve Brooke is a long-time TU volunteer, retired from a long career in natural resources management and protection. Steve was the primary staff person for the Kennebec Coalition’s advocacy for the removal of Edwards Dam. He has been a member of the Maine Council of TU for more than 20 years.